Bob Berry is a retired construction engineer who lives just outside of Ray City, GA with Diane, his wife of many years. Bob remembers that as a young man, he and his family would visit his grandparents’ home where Dominiques and Delawares could be seen scratching and pecking in the grass. It was there he fell in love with chickens. Bob has taken these two pasture breeds along with a few others, raises them himself, and hatches chicks in his yard. These chicks don’t come from a hatchery that is based more on profits; these chicks come from Bob’s small self-owned hatchery where personal care is given to ensure that each rooster and hen is given all the care and attention it needs to grow healthy and happy. Bob’s love and care for each of his roosters and hens show in the generations of chicks that he passes on to his customers. Are you looking for chickens or turkeys to add to your farm? 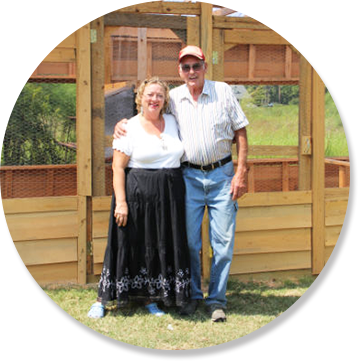 Turn to Bob’s Biddies LLC near Ray City, GA. We are a chicken hatchery that has been offering chicks from a healthy environment for 14 years. All of our breeders are fed with all-natural, non-GMO feed so you can rest assured that they are healthy and disease free. If you love these chicken breeds, then you owe it to yourself to turn to Bob and Diane and buy some of these wonderful chicks. We guarantee to provide you with healthy chicks that you won’t find elsewhere. Contact us using the phone number or email address listed on this website to learn more about our birds and how we can be of service to you.